Recently, we've been expanding our collection from the Adventure Bible series. For those who may be new to this book series, it's a fabulous way to get kids excited about studying the Lord's word and Biblical history. For more information on some of the books that we currently own in the series, please feel free to read my past Adventure Bible reviews. 5-Minute Adventure Bible Stories is just the latest addition in our children's ministry collection. Jim Madsen has been illustrating for the past 15 years. He has worked on more than 50 books including the recently updated NIV Adventure Bible and the NIrV Adventure Bible for Early Readers. Jim lives in Utah with his wife and three children. He enjoys the outdoors, golf, and riding Harley Davidson motorcycles. I really like the set up of this book. It's a large, padded hardcover with about 191 pages worth of Bible stories retold by author, Catherine Devries. Each story in this book is written in a fashion that's meant for children, and as the title states, each one can be told in five minutes. This makes it the perfect book to read right before bedtime or any other moment of the day when children want to get in a good Bible story. Of course, sometimes it's difficult to put down, and we find ourselves reading way more than one. 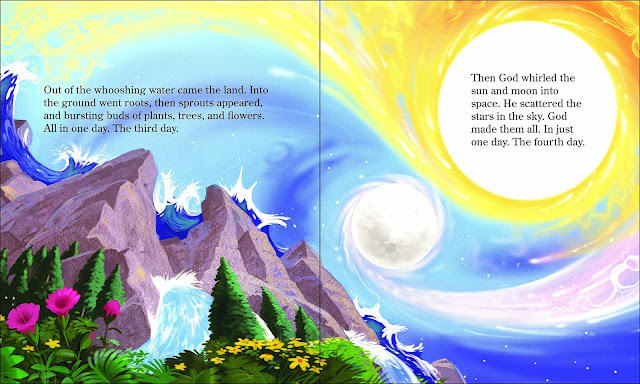 Each Bible story is told in a way that will captivate children of all ages. The illustrations are also something to look at. Each pages is full of colorful artwork that is simply amazing. Even though this is a children's book, you'll find the artwork has more of a mature way about it, since the figures are portrayed with more realistic and lifelike features, rather than cartoonish ones. There are a few simple features added to this book that will be quite helpful to young readers, like a handy Table of Contents that breaks down the page numbers where each story can be found. This is also split up by Old and New Testaments. The back of the book contains a page that offers scripture references, which discuss the return of Jesus Christ. I thought this was a nice inclusion and a very encouraging reminder about our Savior's second coming. Another neat feature is the key that's included at the end of every Bible story. Each one offers a quick fun fact that relates to what was just read, as well as a scripture verse for further reflection. The beginning of each story also contains a passage notation of where it can be found in the Bible. The only thing that's missing in this book is a nifty ribbon bookmark for children to keep their place. Luckily, we have plenty of traditional bookmarks lying around ready to be used. The recommended age group for 5-Minute Adventure Bible Stories is four through eight. I found this to be pretty accurate as far as the way each story is told. I do have to note that some stories in this book have a bit of extra text that may be difficult for a preschooler to read on their own. I've been reading this with my son, which works just fine for us. He really enjoys the stories and is quite attentive to each one we read. There is a nice mix of both Old and New Testament accounts such as the story of Noah, Moses, and plenty that mention the life and teachings of Jesus, from His birth all the way through the time that He appeared to the disciples after His death (Acts 1).